There's no doubt about it: metallics have the power to elevate almost anything to glamorous new heights. Specific metallic finishes--just like colors and patterns--come in and out of style when it comes to home decor. Brass was the big thing in the 1980s, followed by cool metals such as silver in the late '90s. Now, almost anything goes when it comes to metals; mixing metals and finishes is even encouraged. That being said, however, copper is definitely having its moment to shine. Copper's rosy glow complements lots of color palettes. It contrasts beautifully with jewel-toned blues and greens, and warms up lighter hues like Rose Quartz and Serenity. When copper couples with black and white, it has a modern appeal. While spray paint is one of the quickest ways to give objects a metallic glow, copper materials--unlike gold--have the added advantage of being relatively inexpensive and easy to find. 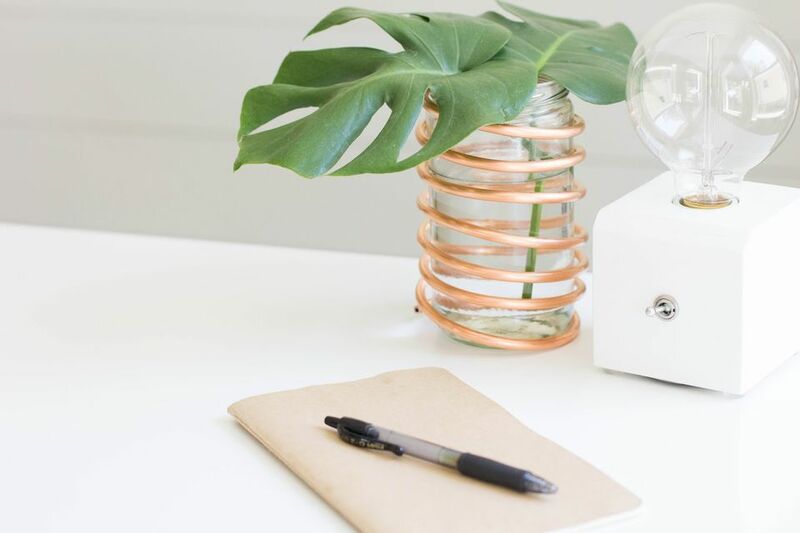 A trip to your local hardware store, in fact, will yield copper wire, coil, tape, pipe fittings, and even contact paper that will help you transform humble items into chic home decor. Here are thirteen project ideas to inspire you. Copper coil pipe from the plumbing section of the hardware store can inspire loads of project possibilities, and a five-foot length costs less than ten dollars. Here, it's simply wound around a simple glass cylinder vase (you can pick these up at the dollar store) to give it style that only looks expensive. One single green leaf makes a contemporary, organic statement. Have leftover copper coil from the above project? Great! Twist it into a free form shape to make an objet d'art that will add style to a coffee table or bookcase. Give it height by placing it on top of a stack of books. Coat those primary-colored alphabet fridge magnets with copper spray paint so your kids can enjoy playing with them, and you can enjoy looking at them. A frameless round mirror is elevated to stylemaker status by adding copper tape to its edge. Tape like this can be found in the garden section of hardware stores (believe it or not, it deters snails and slugs), and also at most craft stores as a common supply for making stained glass. Protect surfaces from the damage cold and hot drinks can cause with a DIY set of coasters made from sandwiching decorative paper (you could also use photographs) between two squares of glass. These have edges sealed with copper tape to give them a sophisticated, store-bought look. Here's another project to make with copper tape. This inexpensive dorm-room-type mirror received a major facelift. Copper tape applied to its edges and on the mirror itself creates a beveled look that would fool the most discerning eyes. The hardware aisle has become prime hunting-ground for do-it-yourself home decorators. Copper pipe and plumbing fittings are especially versatile materials for making trendy home decor. This sling, for instance, is made from a pair of old jeans and copper plumbing supplies. It will work hard to support your magazine habit, and look great, too! This mid-century modern plant stand is a dead-ringer for designer versions from retailers such as West Elm. With just a few plumbing supplies and tools, you can give your houseplants a boost, getting them off the floor and closer to natural light sources. As an added bonus, copper looks great with green. Copper wire--which is much thinner than copper coil and can be found in the electrical aisles of hardware stores--is also malleable and useful for making all kinds of things. These leaf-like sculptures would lend organic elegance to a mantel, or add interest to built-in bookcases. Upcycle a few mini wine bottles by turning them into an interesting bud vase wrapped with copper wire. Insert single, simple stems such as Gerbera daisies for a modern look, or fill them with wildflowers or baby's breath for a farmhouse feel. Create typographic art with thin-gauge copper wire by bending it into meaningful words or phrases. Frame your wire word for an interesting addition to a gallery wall, or adhere it to a piece of weathered wood to make a interesting sign. Did you know there was such a thing as copper contact paper? Imagine the possibilities! Cut shapes or words out of this useful, adhesive-backed material to adorn any number of things such as trays, picture frames, boxes or--in this case--vases. Here, a modern, geometric shape gives plain vases an expensive-looking makeover.